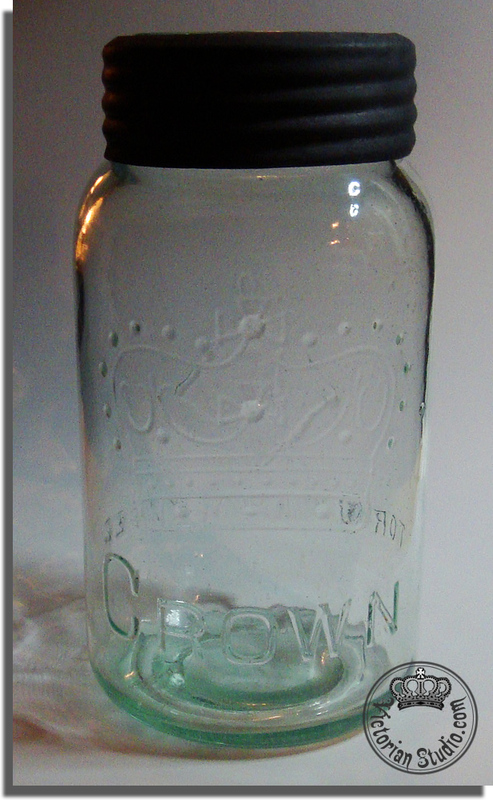 Yes, my 8th Crown Jar. But I had to have it. Not because it is another undated (ie. early piece) in a beautiful aqua colour. Nope. 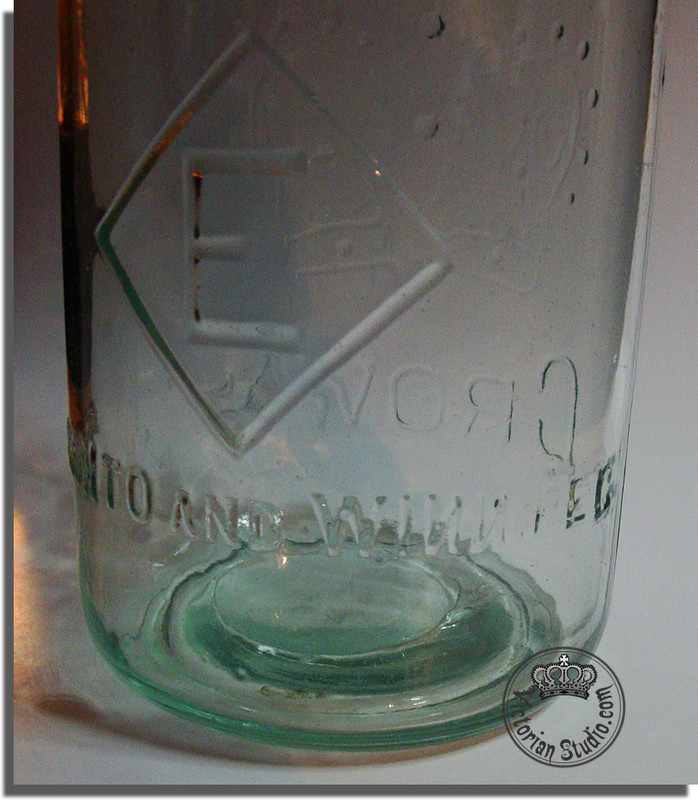 Not because it had a different top than my other ones; marked with "Hamilton Glass Co. Hamilton Ont." Not even because it is a jar from the old Canadian department store "Eaton's" (marked by the diamond with the letter E on the reverse). 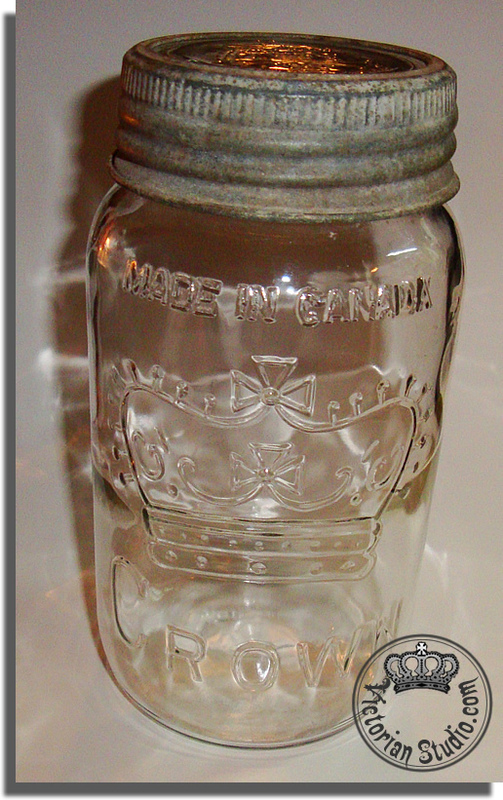 It was because it also was stamped with "Toronto and Winnipeg" on the back too. And ESPECIALLY because of the "error"... can you spot it? Yep... this jar DEFINITELY belongs here in my home town! On the drive to the first thrift store, we were chatting about what we were on the hunt for (her: a few small tables and old frames, me: some goodies for my studio, natch). 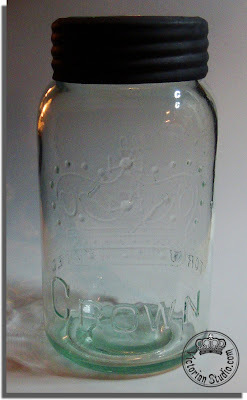 I don't really know why, but I specifically mentioned that if she saw any Crown mason jars, to snag them for me. 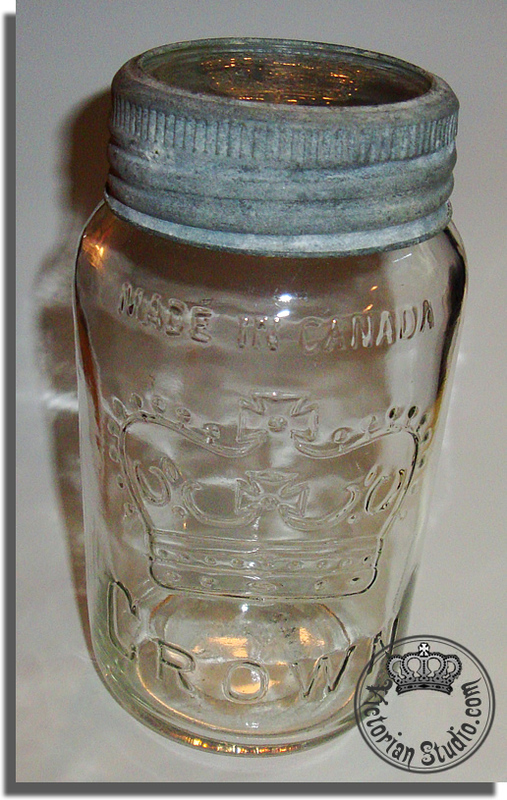 I have been searching for any in the local shops without success - it seems mason jars are getting harder and harder to find as many people are using them in decorating and they're all the rage for wedding table decor. If I didn't find any soon, I was going to eBay as a last resort. But they weren't cheap there: averaging around $ 15 (plus shipping) each. 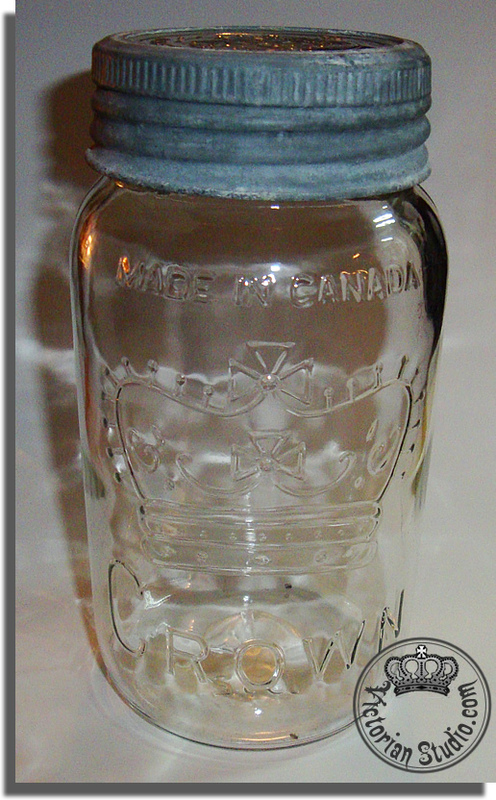 Crown Jars were only manufactured in Canada -- from the late 1800's to the mid 1960's. Early jars are not dated on the bottom and have bubbles in the glass. 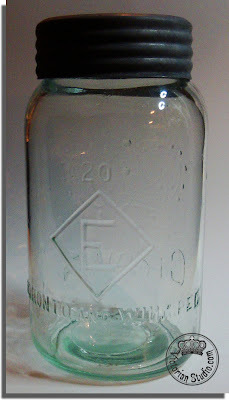 Prior to World War I, manganese dioxide was used to clarify glass (to turn it from blue or green to clear). However, this chemical turns the glass a purple hue in the sunlight. In 1914 when the War broke out, manganese dioxide was cut off from suppliers in Russia to Canada by German blockades. This forced them to use selenium instead to clarify glass which does not turn purple in sunlight. 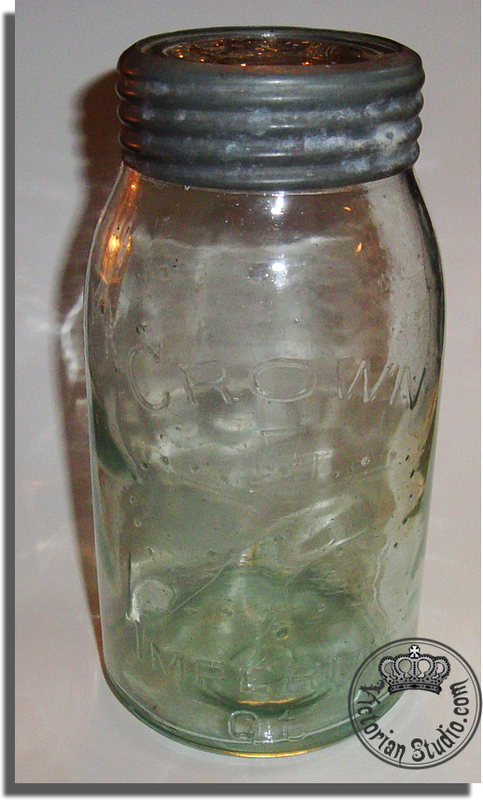 So purple jars are pre-1914. Purple, green, blue and amber glass colours are the most valuable. 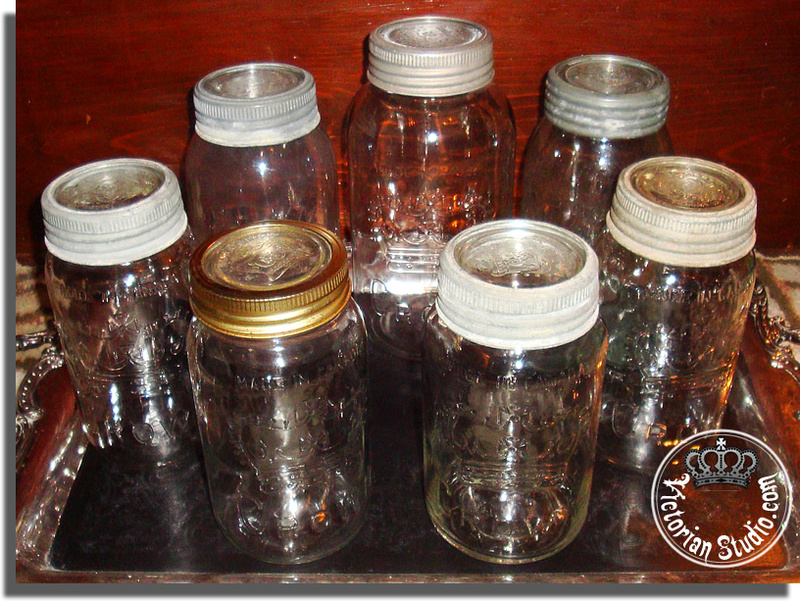 Old jars were also hand-blown and had the tops broken off and ground smooth. A ground lip is flat and rough to the touch. 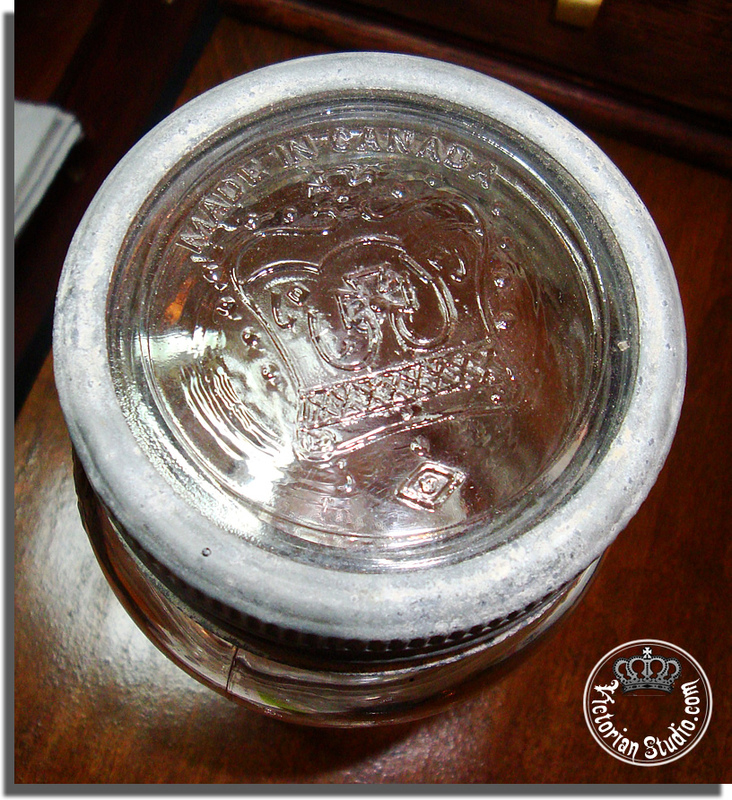 Newer Crown jars have smooth, rounded (machined) lips. 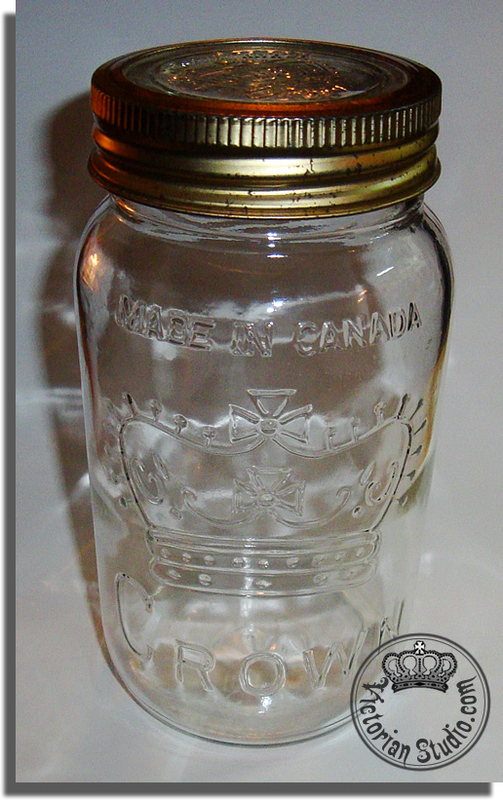 The design of jar varies as well over the years; the shape of the crown and style of "pearls", as well as the placement of the text: "Crown", "Made In Canada" and the inclusion or exclusion of "Imperial Qt" could be above or below the crown image. And of course there are a variety of sizes. Yep, I could see this might be a dangerous / addictive item to start collecting. 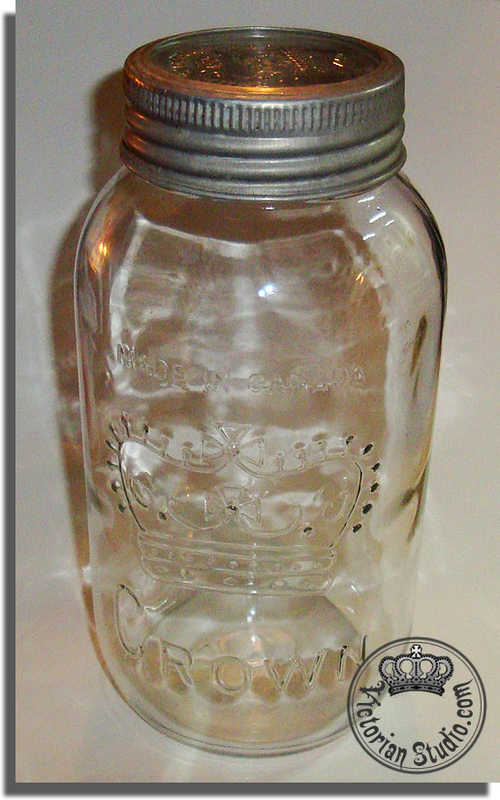 But I just wanted at least ONE Crown jar for my Victorian Studio... perfect to store some buttons or other embellishments in royal style! So back to our shopping spree yesterday... we hit a few thrift stores, a garage sale, the mall, had a yummy lunch and decided to visit a local antique store before heading home. With EVERYTHING in the shop at 50% off, we were sure to find something! 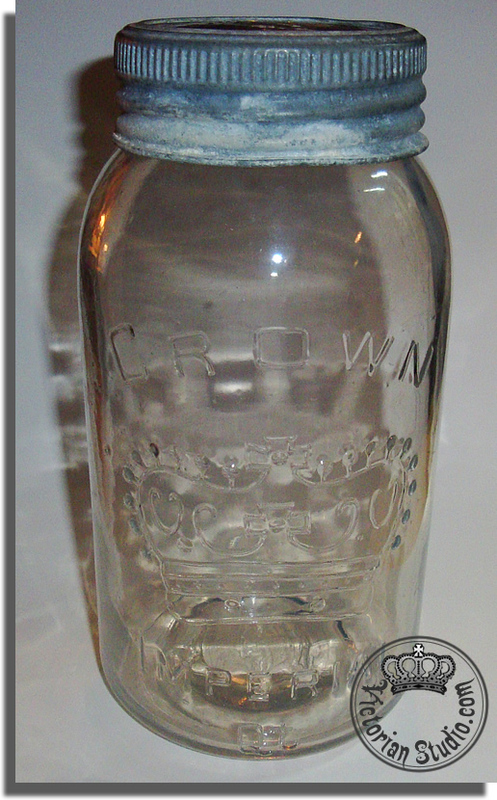 Pre-1918 Green Crown Jar - 8" tall "Imperial Quart"
Pre-1914 Purple Crown Jar - 8" tall "Imperial Quart"
The purple jar is hard to see using flash photography... but in the sunlight it is definitely purple! Yahoo! I love the old green one too. Aw, heck. And most of all, I love the time I get to spend with my daughter, sharing the thrill of "The Hunt" together! 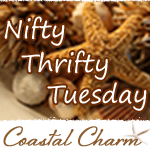 I will be posting about all the other goodies (there are quite a few!) we each brought home in the next few days! If you didn't read THIS post, the short-story is that I acquired these four frames last month with plans to decorate my studio with them. 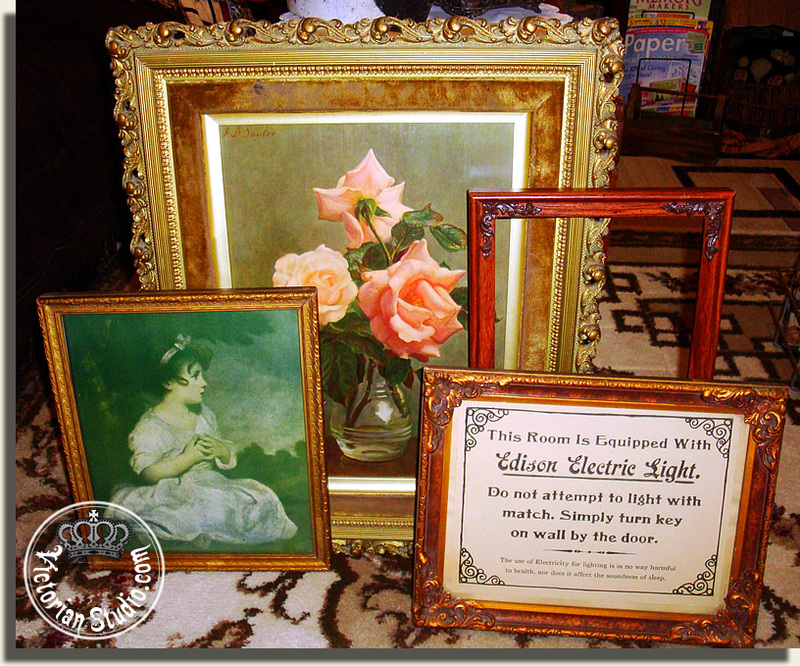 I knew I was going to do something with the largest painting (the roses), as it wasn't a painting at all, but a print - yes, a nice picture, but it was the incredible old frame I really wanted. I purchased a nice thick piece of corkboard at Michael's and glued it on with E6000, adding two wooden border trims to fill in the top and bottom. 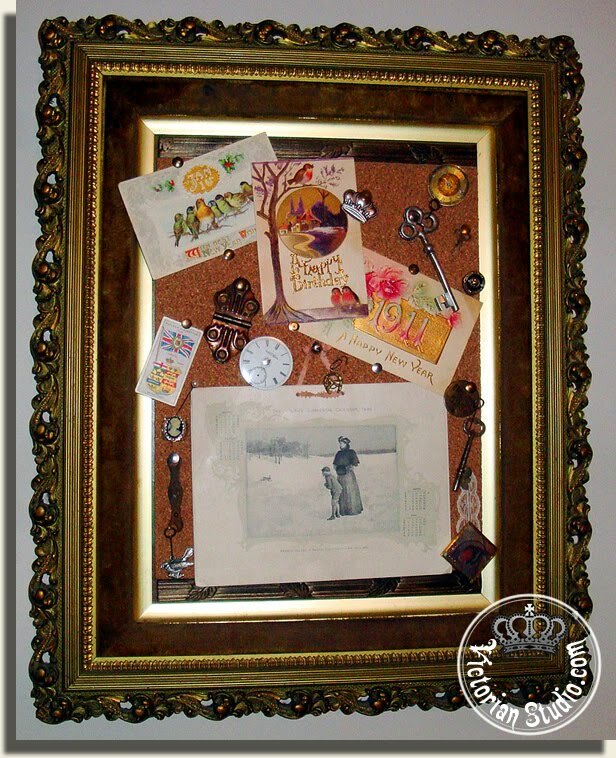 I love that I can pin all sorts of old treasures to it and that it suits my decor much better than the plain-framed boards I used to have. 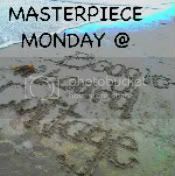 Probably one of the easiest projects I have undertaken! Black and silver... seems I had a run of it last week. 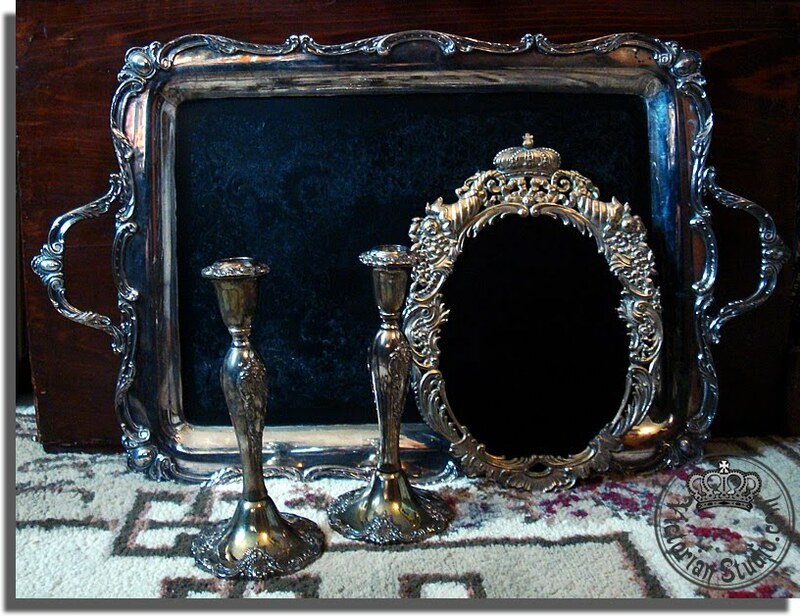 Whilst at Value Village I spotted a few items that went immediately into my cart: the large silver-plate tray and two silver candlesticks. 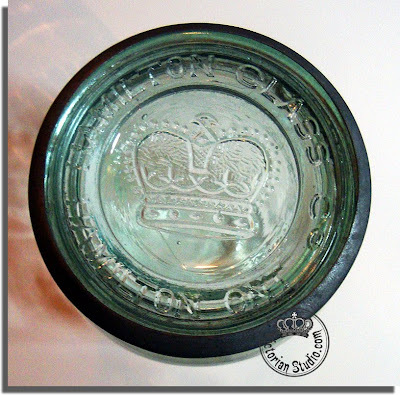 The oval piece in the photo below was won on eBay. 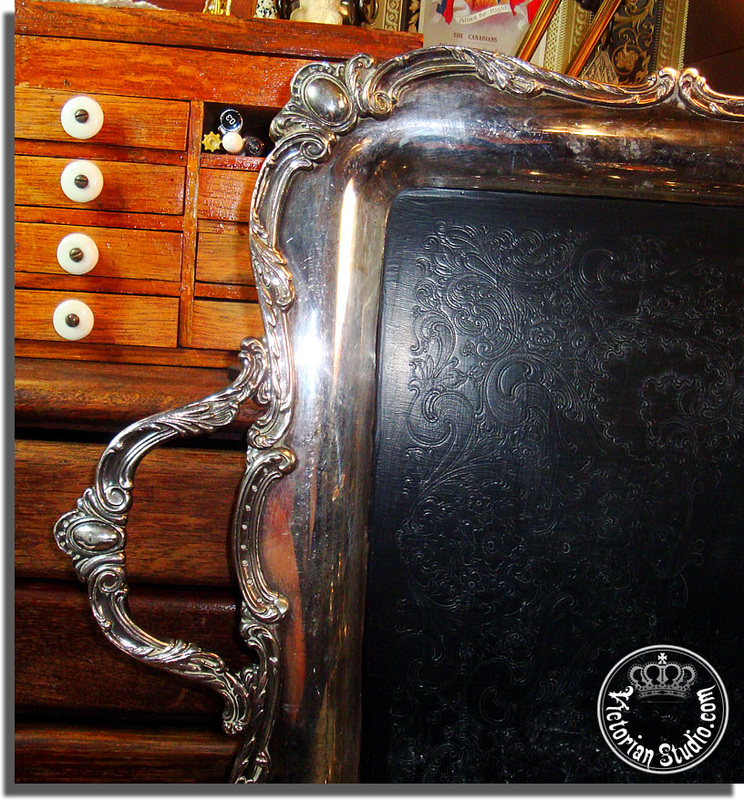 It's a vintage mirror that had some damage to the back silvering - not the glass itself, so I painted it to create a great Victorian-look chalkboard. I used chalkboard paint on the large silver tray too since it is silver-plate over copper, so it's not magnetic -- just as well as I already have a silver tray I use for a magnet board. The copper base also makes this sucker HEAVY. It weighs in at an impressive 13 lbs on my bathroom scale! 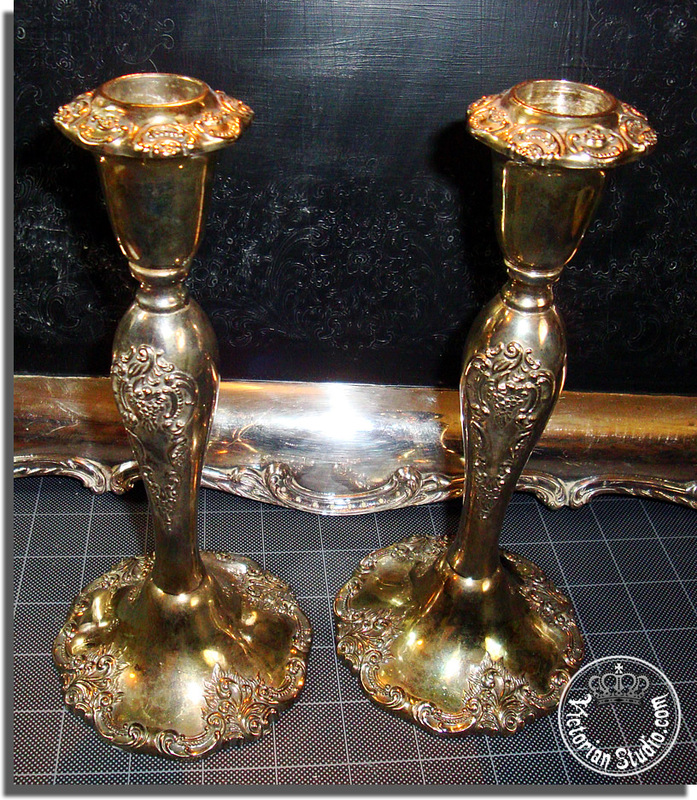 Speaking of heavy, these old silver candlesticks are hefty too. I love the intricate scroll work. 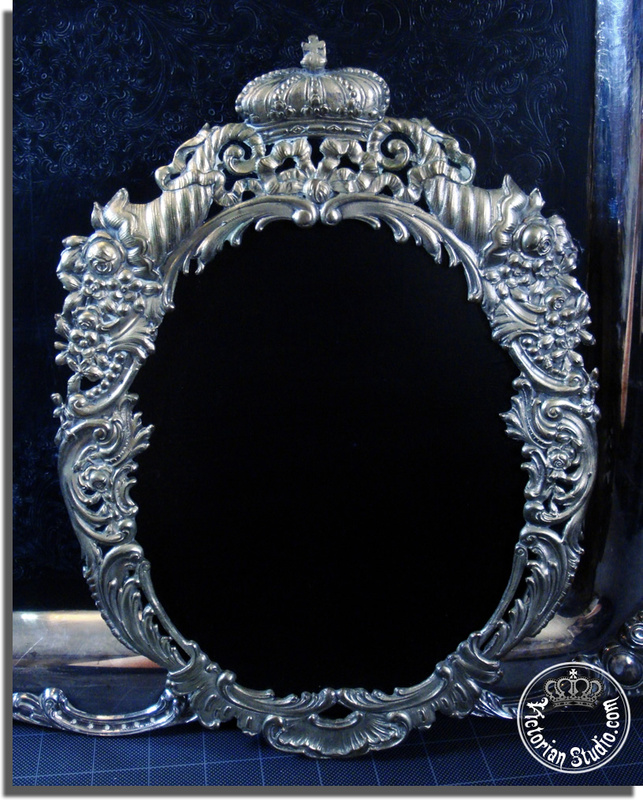 Here's a closeup of that oval mirror. I adore the crown at the top; just perfect for my Victorian Studio to be sure! 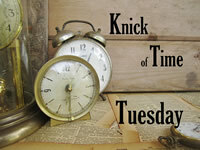 And Knick of Time's Thursday's Theme: Chalkboards! Thank you, thank you, thank you to everyone who visited, left a comment and became Followers of my blog for my "Where Bloggers Create" post! I was frankly overwhelmed with the responses, lovely compliments and new bloggy friendships that were made. 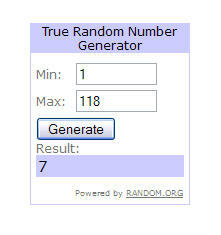 I also had such a wonderful time visiting the hundreds of beautiful blogs that participated in Karen's party. I will continue to return to quite a few for inspiration many, many times. I will contact you for your mailing address - I do hope you enjoy all your new (and old!) goodies!